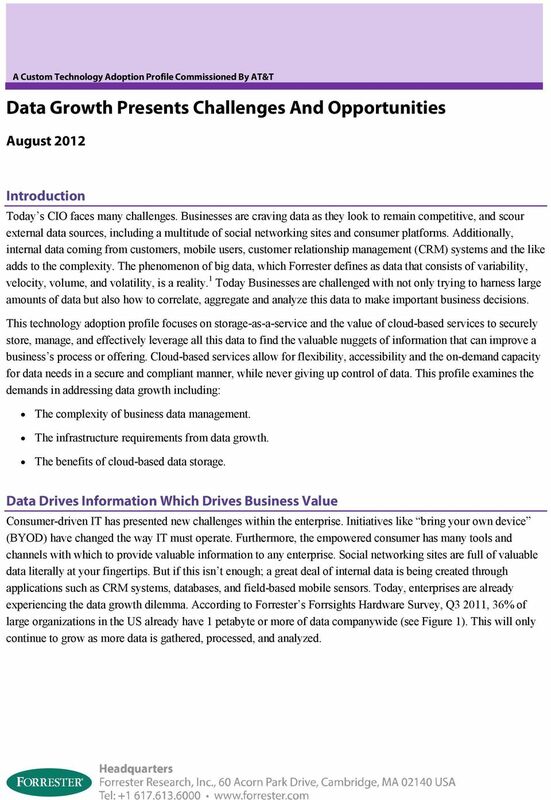 Download "Data Growth Presents Challenges And Opportunities"
1 A Custom Technology Adoption Profile Commissioned By AT&T August 2012 Introduction Today s CIO faces many challenges. Businesses are craving data as they look to remain competitive, and scour external data sources, including a multitude of social networking sites and consumer platforms. Additionally, internal data coming from customers, mobile users, customer relationship management (CRM) systems and the like adds to the complexity. The phenomenon of big data, which Forrester defines as data that consists of variability, velocity, volume, and volatility, is a reality. 1 Today Businesses are challenged with not only trying to harness large amounts of data but also how to correlate, aggregate and analyze this data to make important business decisions. This technology adoption profile focuses on storage-as-a-service and the value of cloud-based services to securely store, manage, and effectively leverage all this data to find the valuable nuggets of information that can improve a business s process or offering. Cloud-based services allow for flexibility, accessibility and the on-demand capacity for data needs in a secure and compliant manner, while never giving up control of data. This profile examines the demands in addressing data growth including: The complexity of business data management. The infrastructure requirements from data growth. The benefits of cloud-based data storage. Data Drives Information Which Drives Business Value Consumer-driven IT has presented new challenges within the enterprise. Initiatives like bring your own device (BYOD) have changed the way IT must operate. Furthermore, the empowered consumer has many tools and channels with which to provide valuable information to any enterprise. Social networking sites are full of valuable data literally at your fingertips. But if this isn t enough; a great deal of internal data is being created through applications such as CRM systems, databases, and field-based mobile sensors. Today, enterprises are already experiencing the data growth dilemma. 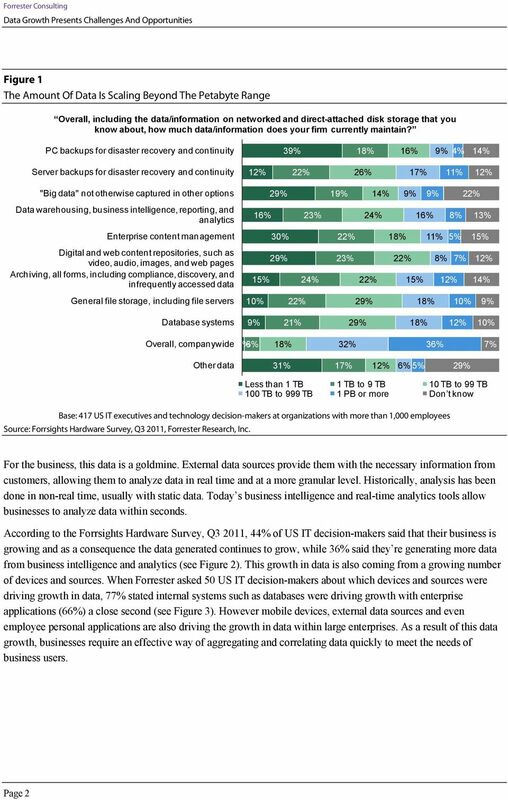 According to Forrester s Forrsights Hardware Survey, Q3 2011, 3 of large organizations in the US already have 1 petabyte or more of data companywide (see Figure 1). This will only continue to grow as more data is gathered, processed, and analyzed. If you had your choice of two work devices that would make you most productive in your job, which two devices would you prefer to have?